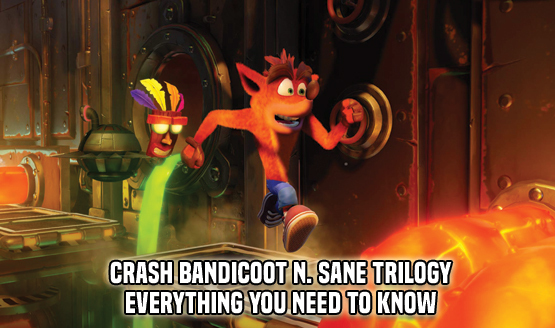 It’s the remaster that many believed would never happen — Crash Bandicoot, Naughty Dog’s larger-than-life gaming mascot that has been living under the roof of Activision for almost a decade, is about to stage a triumphant comeback in the form of Crash Bandicoot N. Sane Trilogy. Coming to us by way of Vicarious Visions, the N. Sane Trilogy bundles together the first three Crash games — namely Crash Bandicoot, Cortex Strikes Back, and Warped — for the relatively reasonable price of $39.99. But the real selling point is the fidelity to Naughty Dog’s original PlayStation classics, as each title has been lovingly remastered to evoke memories of nights spent hurtling through levels to smash crates, collect gems, and best your previous time trial. So, you’re ready to indulge in some good ol’ ’90s nostalgia? Not so fast! In anticipation of its launch on June 30, we’ve scoured the four corners of the internet — and the PSLS archives — to compile all the necessary information you could ever need pertaining to Vicarious Visions’ remake remaster plus.